Using the latest Bluetooth Chipset V4.1 Provides High Sensitivity Microphone to Ensure Quality Calling. Wide Application Range Such as Car, Speakers , Headphones and So On. Power On: Press MFB for 3S. Power Off: Press MFB for 3S. Exit Pairing Mode: Device Will Exit Pairing After 150S If No Action. Shut Down: Automatically Shut Down if No Connection in 10 Minutes. Redial Last Phone:Press MFB 2 Times to Re-Dial Last Phone Number. 1. If you can not turn on the product for the first time, maybe the battery is low, please try again after the device is fully charged. 2. Do not put the receiver in high temperature that is above 45℃ or exposed to sunshine, as it will influence service life. 3. It may result in damage to the receiver if the input voltage is too high, please follow the instructions. WIDE COMPATIBILITY : Compatible with Most Bluetooth Enabled Devices Like Smartphone, MP3, Tablet, etc, Ideal for Home or Vehicle Audio Systems. Converting your Standard 3.5MM Speaker System to a Wireless Sound System Power House, Other Devices like Android Smartphone, Apple iPhone, Blackberry, HTC, LG, SONY, Tablets & More. 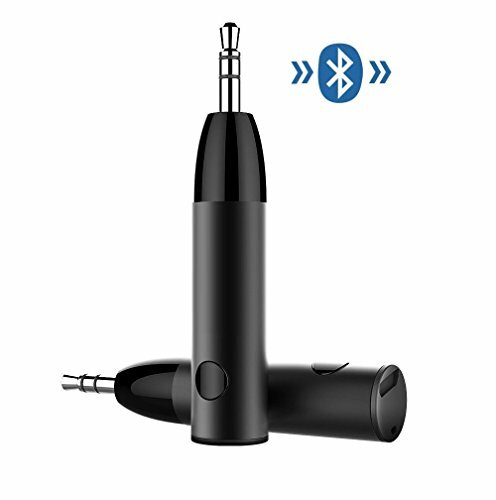 BETTER CONNECTIVITY : Equipped with the Reliable Bluetooth 4.1 for Faster and More Stable Connectivity, this Bluetooth Car Adapter Supports A2DP, AVRCP, HSP, and HFP. PORTABLE MINI DESIGN : Compact and 0.55OZ Lightweight Build Makes it Space-Saving and Could Easily Take On Your Travel. If you have any questions about this product by D & K Exclusives, contact us by completing and submitting the form below. If you are looking for a specif part number, please include it with your message.